About 6 kilometres outside Stellenbosch the second oldest town in South Africa near the top of the Helshoogte Pass is a beautiful valley surrounded by mountains. It is in this valley that the Thelema Wine estate can be found. 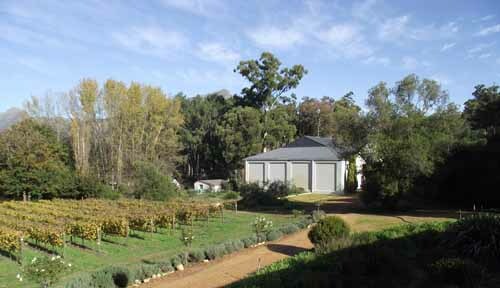 The Thelema farmlands are 157 hectares in size and are situated on the southern slopes of the Simonsberg. The land under vines varies between 370 and 640 metres in elevation above sea level and are swept by the cooling south easterly winds during summer. In 1983 when the farm was purchased by McLean Family Trust there was not one vine planted on the farm although prior to purchase grapes had been grown. What the family purchased was a fruit farm with run down plum and pears orchards. 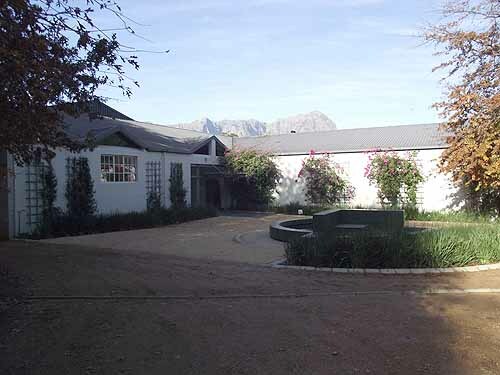 This was not a problem for Gyles Webb and his family whose main aim when purchasing the farm was to turn into a wine farm producing quality wines that would make South Africa stand out in the wine markets of the world. Work on the farm began in 1983 when it was decided to tear out the old orchards and clear virgin mountain land so that vines could be planted. Since 1983 fifty hectares of vines have been planted on the farm where the orchards once grew. The vineyards have been planted with a variety of wine producing grapes which include Chardonnay, Sauvignon Blanc, Riesling, Muscat de Frontignan, Cabernet Sauvignon, Merlot and Shiraz. Once the vines had been planted and the vineyards started producing grapes success came quickly. Gyles Webb won the Diners Club winemaker of the year award in 1994 for his1992 Cabernet Sauvignon/ Merlot and again in 1996 for his Cabernet Sauvignon 1994 vintage. Many other awards have followed since those early days including being adjudged to have the best vineyards in the Stellenbosch region for three years in a row. A feat which takes some doing if you have visited other farms in Stellenbosch and seen the quality of the vineyards in the region. The first wines produced on Thelema were made in 1988 and came out of the cellars of the the farm's winery which was built in 1983. Over the years as new vineyards have been planted production has increased steadily and today the farm produces approximately 40000 cases of wine per annum. 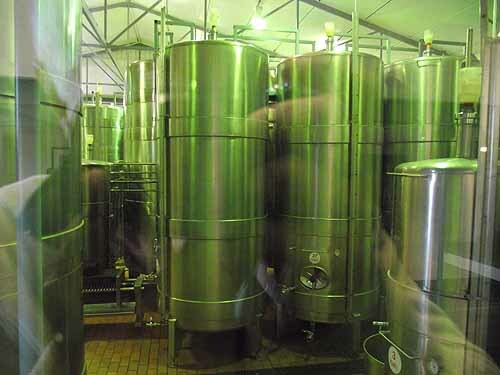 Not all the wines produced by Thelema are grown on the Thelema farm. The Webb's have purchased another farm in the Elgin area (known for its apples) called Sutherland which was also once a fruit farm and has now been turned into a wine farm. 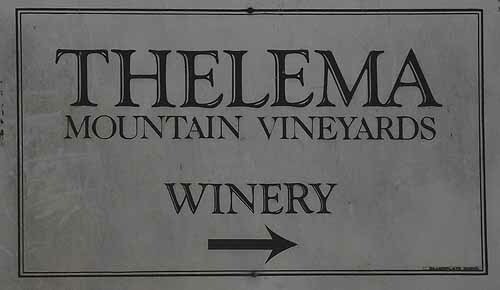 The grapes produced on this farm are transported to the Thelema winery where they are processed and turned into wine. People who want to visit Thelema have to travel up to the top of the Helshoogte Pass and just where it starts to drop down into the valley a road leading off to the left to the Tokara winery will also take you to the Thelema farm. Drive past the entrance to Tokara and follow the road down into the valley where you will spot the entrance gates going off to the right. Once you have entered the farm you will drive through the vineyards along a t narrow winding road that leads down to the winery and farm buildings. 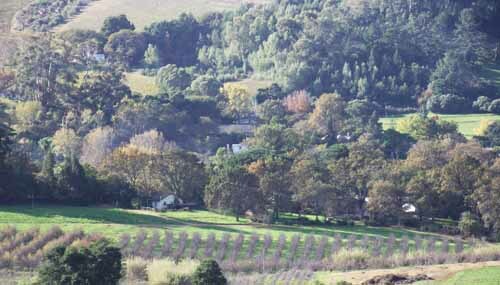 As with most farms in the Stellenbosch area there are a number of large oak trees growing on the farm. The oak trees on this farm are large and appear to be very old. Oak trees were originally introduced into South Africa by Simon van der Stel whose main reason for introducing them was to provide oak for wine barrels. 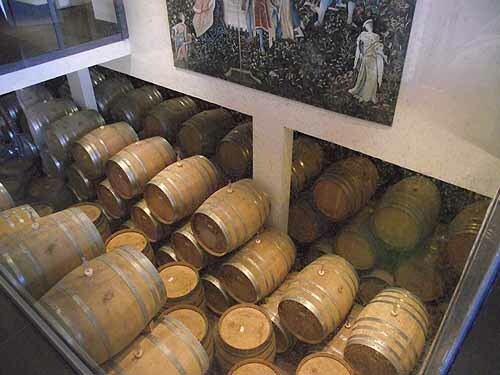 Unfortunately the climate was to warm for the oak trees and the wood produced from them was too porous and useless for wine making consequently today oak is imported from France, America and Australia to make wine barrels. 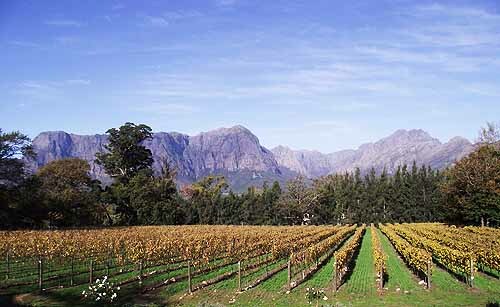 The wine industry's loss is Stellenbosch's gain as the lovely oak trees today beautify the town and surrounding farms. On arrival in the parking area at the bottom of the winding road you will spot the entrance to the winery and the public reception area. These buildings look out over some spectacular scenery in the valley topped off in the background with some beautiful mountains. The reception area of the farm also doubles as a wine tasting area and it is here where you have your chance to taste some of the spectacular wines produced on this farm. 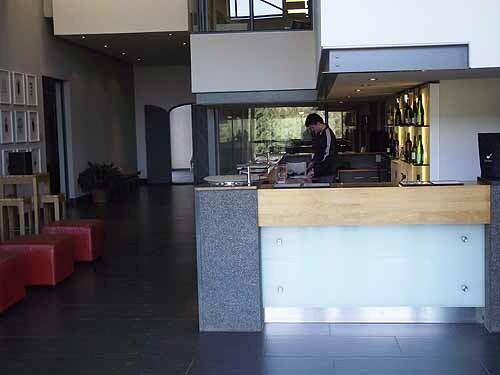 The reception area is situated above the wine cellar and from it you can look down and see some of the wine barrels being used to mature the wines. When I visited the farm recently the staff were very pleasant and eager to let me taste their wines. Comparing this farm with others in the area one can see the distinct difference in what the various farms have set out to do. The Tokara wine estate which borders onto Thelema has built a number of restaurants and a fantastic wine cellar to impress visitors whereas Thelema has gone about its business by producing excellent award winning wines and not following the good food and wine theme that most other farms have done. Its aim at the beginning was to let its wines do the talking and it has achieved its success by doing just that. Enjoy an afternoon out exploring the wine farms at the top of the Helshoogte pass. You can experience extreme luxury at one farm, good food and wine at the other and excellent award winning wines at Thelema.